Voice assistants like Google Home are excellent kitchen aids. They can set timers, add things to your grocery list, and play music while you cook. But the Google Home has one standout kitchen feature: you can use it to read off recipes one step at a time while you cook. Here’s how to find recipes, send them to Google Home, and get hands-free step-by-step instructions. First, you’ll need to pick a recipe that you want Google to walk through. You can find them a few ways. First, and perhaps the easiest, you can search for recipes on your phone. 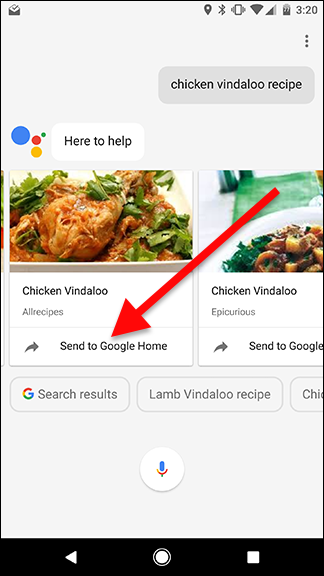 Open up Google Assistant or Google search on your Android or iPhone and search for the kind of recipe you want. You’ll see a scrolling list of recipes to choose from. When you’ve found one that looks good, tap Send to Google Home. You can also search for recipes on Google Home directly, where Google will read each result out one by one until you find a recipe you like. Once the recipe is started, Google Home will recite the recipe one piece at a time. Google will ask if you want to hear the ingredients or skip straight to the cooking instructions. Whichever one you choose, you have several voice commands you can use to control playback of the recipe. “Ok Google, Next step.” This command will play the next step in the recipe. “Ok Google, Repeat step.” If you need to hear another part of the recipe again, use this command to have Google Home repeat the last step you heard. “Ok Google, What’s step [x]?” You can use this to hear one of the steps out of order without losing your place. For example, if you’re on step four of the recipe, but you want to hear what step two was again, you can say “What’s step two?” and Google will play it. The next time you say “Next step,” Google will continue to step five. In between each step, you can use any Google Home command like normal. You can play music or set a timer, then say “Next step” to continue. Google will remember where you’re at in the recipe even when you’re doing something else.